The platform unites all the major stakeholders from different sectors and is the main consensus building instrument in Lithuanian ecosystem for industry digitalization. The establishment of the Platform was initiated by the German-Baltic Chamber of Commerce (AHK) together with the Engineering Industries Association of Lithuania (LINPRA), the Lithuanian Confederation of Industrialists (LPK), the Information and Communication Technologies Association (INFOBALT), Vilnius Gediminas Technical University (VGTU) and Kaunas University of Technology (KTU) in July 2016. Taking into account the benefits to be received of implementation of such initiative and the meaning for Lithuanian future economy, the Minister of Economy of the Republic of Lithuania supported such initiative and take the role to steer and coordinate the Platform. After one year of intensive preparatory work with initiators and other stakeholders from business associations, industry and the academia we came up with the first results – established the National Industry Digitisation Platform ‘Pramonė 4.0’ and became the first Baltic State that has such platform. 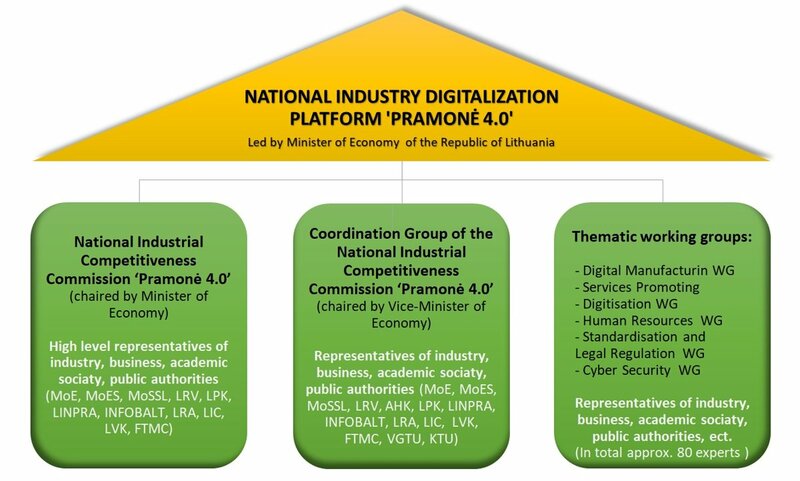 The platform operates at different levels and it compose the National Industrial Competitiveness Commission ‘Pramonė 4.0’ (Commission ‘Pramonė 4.0’ ), the Coordination group of the National Industrial Competitiveness Commission ‘Pramonė 4.0’ (Coordination group) and the thematic working groups that work in the areas of digital manufacturing, services promoting digitization, standardisation and legal regulation, human resources and cyber security. The Commission ‘Pramonė 4.0’ is led by the Minister of Economy and is the basis for the functioning of established national platform ‘Pramonė 4.0’. The Commission ‘Pramonė 4.0’ consists of the high-level representatives from LPK, LINPRA, INFOBALT, Lithuanian Robotics Association (LRA), Lithuanian Innovation Center (LIC), Lithuanian Business Confederation (LVK) Government of the Republic of Lithuania (LRV), Ministry of Education and Science (MoES), Ministry of Social Security and Labour (MoSSL) and the Center for Physical Sciences and Technology (FTMC). All these stakeholders also represent at the Coordination group, which also includes the representatives from AHK, KTU and VGTU. The main tasks of the Coordination Group are to analyse and discuss the information provided by thematic working groups and to make proposals to the Commission ‘Pramonė 4.0’. Furthermore, more than 80 additional experts from business, industry, academia and public sector are involved into activities of the Platform through working groups. The platform seeks competitiveness and the productivity of industry as well as on promoting industry in the integration of digital solutions and new technologies. The platform serves as a venue for active and early stage involvement of major stakeholders (including businesses) at various levels (Commission ‘Pramonė 4.0’, Coordination group, thematic working groups), thus helping to create a strong dialogue between industry, research, education and governmental institutions to anticipate change, adapt to the future needs, propose the most efficient solutions for the digitalisation of industry. The platform has high-level representation from policy makers and from industry leaders.